Even the cover is creepy. It’s been awhile since I read something in the horror genre. In the case of The Haunting on Ruckman Road, I would say it’s more ghost story or psychological thriller than horror novel. That doesn’t stop some bad things from happening. In Hampton, Virginia, Detective Alex Penfield is trying to come back from a gunshot wound he suffered in the line of duty. His first day back on the job sees him investigating a possible death in Fort Monroe. The only problem is, the body seems to have disappeared. Either it washed into the bay, or the victim wasn’t dead to begin with. Uncertain of exactly what’s going on, Penfield and his partner decide to investigate the missing person’s house, a large place up on Ruckman road. Inside, they find a virtually empty home, except for all the cameras and months of recordings of empty rooms stored on a computer. What exactly was going on in that house? And who will believe it? 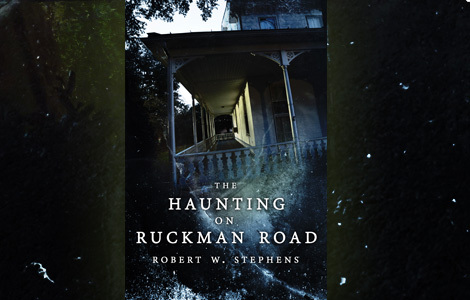 Author Robert W. Stephens is pretty good at creeping people out (at least for this reader). There were several goose-bump-inducing moments, which is what I was looking for when I picked up the book. They are not stomach turning, gory, gross-out moments. They are the kind of events that let your imagination go the extra steps, tapping into your own fear of turning on a shaky light in dark basement on a stormy night. There is also a larger mystery surrounding the house. Why is the victim’s sister so drawn to it suddenly? Why does Penfield see things his partner doesn’t? Why does his partner seem to distrust everything about the case? While the supernatural events draw you in, it’s the mystery that really propels the story. However, The Haunting on Ruckman Road is a bit of an odd tale, structurally. There are three beginnings, which is two beginnings too many, in my opinion. What’s interesting is that the events in all three beginnings belong in the story, and are actually important to the depth and makeup of the main character. They shouldn’t be occupying the same space, though. Because this is a mystery, and with the psychological elements affecting Penfield, I would have preferred the story start with the outside observer who is recording these events in an interview with Penfield. The other two beginnings could have been revelations throughout the novel, opening up the character as the mystery also opens up. Finally, I like those mysterious endings where you don’t really know everything, and you know you don’t know it. Here, the short ending chapter was a really nice touch. It leaves you with that feeling that if you could go find that house, the scary stuff might still be going on. That said, there were maybe a few too many unanswered questions. I was actually left confused about a couple of parts, which dulled that ending just a bit. But it’s still the perfect ending. On the other hand, this is only the first novel in new series (according to the “About the Author” section). Perhaps author Robert Stephens is simply saving something for the next volume. If so, it should be interesting. So there you go. It’s a quick read, but a good story, with chills and mystery aplenty. Not sure what else you can ask for.